The sgpc and akali dal tried everything in their power to destroy sant ji but failed miserably. 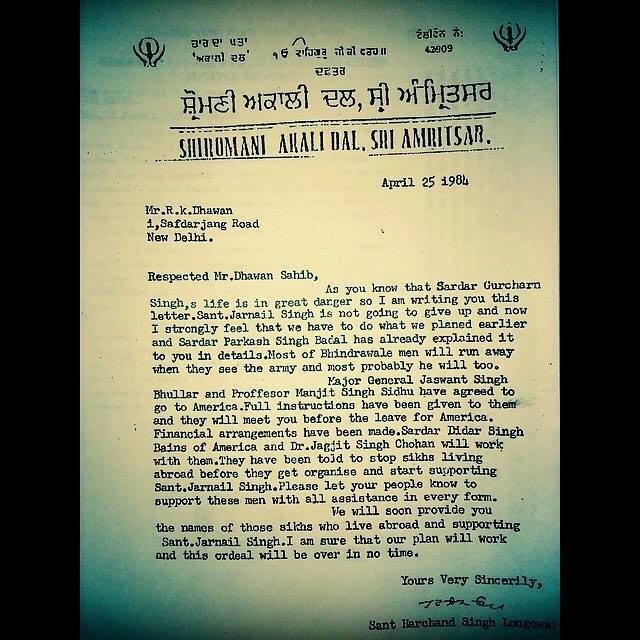 Sending this letter was the last resort which involved calling the army to flush out sant ji and 200 or so singhs. Longowal writes that bhindranwales men will run away seeing the army and most probably bhindranwala will run also. But khalsa ji we all know exactly what sant ji and his singhs did to the worlds 7th largest army. If you carefully read this letter you will notice names of 2 people that were employed to keep the nation settled abroad after the attack. They were employed by the government to hush up sant bhindranwales supporters after the attack in usa and the uk. These are the dirty games played by the akalis and the sgpc. Can we still trust them today? How many other touts do akali dal and sgpc have working for them today? Khalsa ji we need to stay alert.